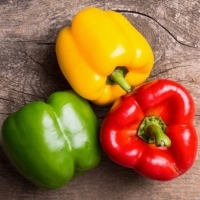 Browse fresh-capsicum suppliers by country and region. Having a botanical name Capsicum annum L, Red Chilli Oleo is also known by the names capsicum annum oil, red chili seed, chili essential oil, pepper essential oil and has its origin in India. The oil is extracted using distillation process from the seeds part of the plant chili pepper that is a hotly pungent variety of capsicum, the oil is derived through passing steam with the source oil having most intense spice. The oil is also used by the aroma therapists as anti-inflammatory, analgesic and digestive aid but should be avoided during pregnancy. Containing medicinal qualities with use also as burn ointments, it is a dark red colored viscous liquid with a thick and viscous consistency. With a strong, pungent and stimulating scent, it cannot be typically blended with other essential oils and has main components comprising oligoalimenti, capsicina, capsanthin, lecithin, Vitamin C and flavonoids. Capsicums can be eaten raw or cooked. Use raw in salads, cut into strips and eat with dips, or use as an edible garnish. 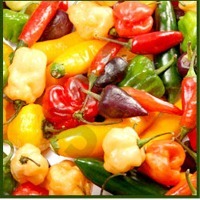 Dice capsicums for use on pizzas; cut into chunks for kebabs; use in pasta sauces; or add to stir fries. Stuff with rice or a breadcrumb mixture and bake. Add roasted capsicums, either hot or cold, to salads and sandwiches. Short on time? 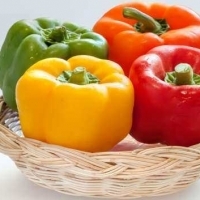 Let fresh-capsicum sellers contact you. As quality is our topmost concern, we give maximum priority to the stringent checking of the entire range of products. Making sure to capture all marketplaces of Bangalore(India), our organization has arisen as an established provider of this range of product. Avalon Agri Exim Pvt. Ltd. Agricultural commodities like cereals, rice, wheat, pulses, eggs, buffalo meat, mutton, fresh green vegetables like capsicum, broccoli, bottle gourd, tomato, okra, other assorted and seasonal vegetables, green chilli, cucumbers. 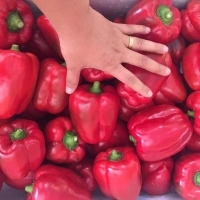 Hong Sheng Bags & Design Ltd.
Color Capsicum harvested daily from farms, packed and delivered to the customers. Grading will be done according to Customer specifications. Black pepper, coconut, fruit, seafood, red bell peper, yellow pepper, bell pepper, betel nut, vietnam agricultural., dried noni fruit. 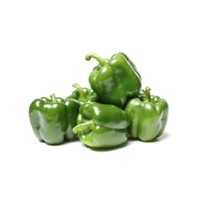 We export l Capsicum in their mature, well-formed stage. One look at the vibrant green colours and their smooth texture will freshen up your senses. Parameter : Value Colour : Green & Yellow Size : All Packing : As Per Client Shipment : By Air / Sea Our Specification Prices : Very competitive Price Delivery Payment : F.O.B, CIF, CNF Shipping : By Air/Sea (By Air charges Is larger than Sea) Minimum Order : 16 Ton Payment Term : T/T Advance, D.P Sight L/C(30% Advance T/T) Delivery Time : 1 day ,every day by Air shipment Packaging : 5kg,20kg,50kg Mesh bag for all vegetables, some vegetables safest carton box Quality : Grade A, Grade B Our Quantity Our organization strictly adheres to the rigorous exercise of quality checking. We are highly demanded and admired amongst the customers for the fulfillment of our true quality commitments.And Also Our Vision is to Reach on Organic Way. we have green yellow,red and orange.